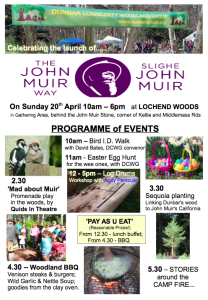 Dunbar Community Woodland Group is embracing the spirit of Dunbar’s most famous son on Sunday 20th April and are gearing up for a day of JM fun in the woods! Most events will take place at the Gathering Space near the corner of Kellie/Middlemas Road. All Welcome. More details at the Lochend Woods website.